Apricot-Mustard Baked Ham | Healthy. Delicious. This week, the theme for Sunday Supper is “low and slow” and it couldn’t have come at a more perfect time. As tempted as I was to pull out my smoker and show you how to make my absolute favorite smoked jerk chicken thighs, I’ve had a giant ham taking up valuable real estate in my fridge for far too long. I was pushing up against the expiration date – it was time to cook that bad boy. Here’s the thing: I don’t really like ham. I eat it at Easter, but only after drowning it in syrupy raisin sauce. I only had this one because Shop Rite gave it to me for free after spending so much money on groceries leading up to Easter. I browsed around for recipes, ultimately settling on this one for Apricot-Mustard Glazed Ham from Martha Stewart. The flavors were simple and straightforward, which I figured would be helpful as I tried to use the leftovers, since they wouldn’t be as limiting as taking a bolder approach might have been. In the end, it was pretty good! 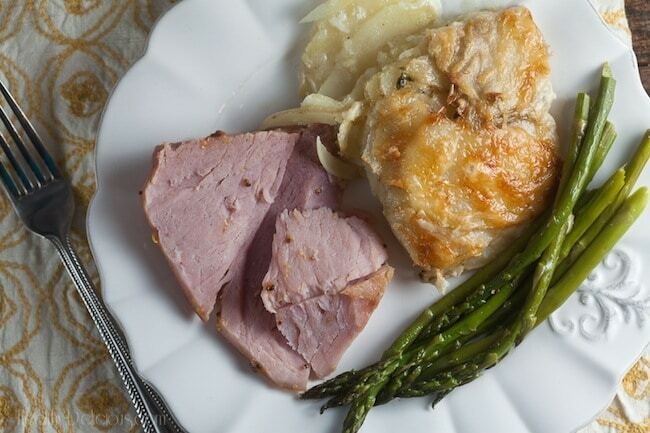 I served it with homemade scalloped potatoes and roast asparagus and, while it wasn’t my favorite meal of all time, it was definitely enjoyable. 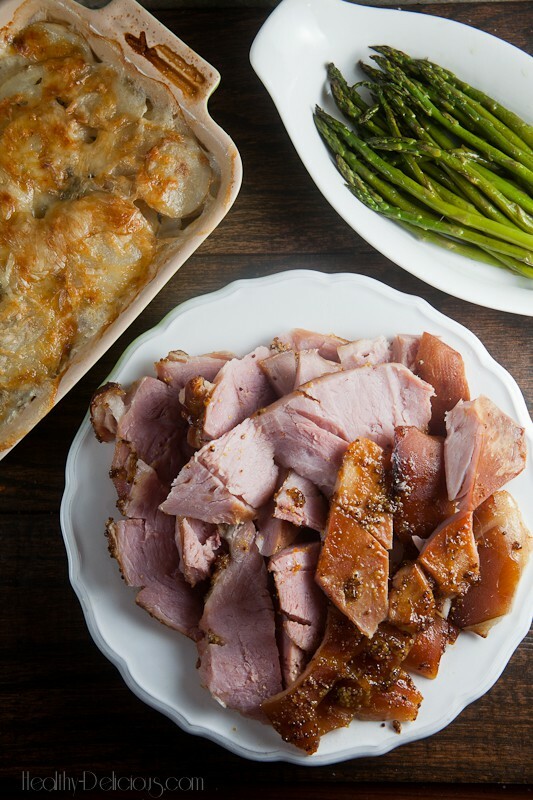 This recipe makes a ton of ham, so invite some friends over and prepare for leftovers. If you have a smaller ham, adjust the cooking time to a total of 10-15 minutes per pound, with the final 30 minutes at a higher heat. Heat oven to 325*F. Use a small chef's knife to cut a diamond pattern over the surface of the ham (cut should be about 1/3 inch deep and spaced about an inch apart). Place the ham in a roasting pan and cover with foil. Bake 2 hours. In a small saucepan, combine the apricot preserves, mustard, and vinegar. Bring to a simmer over medium heat, allowing the preserves to loosen up an form thin glaze. Raise oven temperature to 400*F. Unwrap ham and discard foil. Brush all over with glaze. Return to oven and bake 30 minutes or until skin is crisped and golden brown. Remove ham from oven and let sit at least 10 minutes before carving. 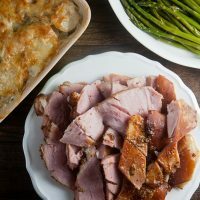 I agree with your thoughts on ham – why do people like it so much on Easter? 🙂 The best way to eat it is clearly the sandwiches the next day. haha. OK, now I really feel brain dead! LOL…no wonder you looked SO familiar! Are you going backed to Mixed? This ham looks delicious! My kids would love making cuban sandwiches for lunch the next day. Good idea! I love apricot & apple cider vinegar so am sure I’ll love this dish. Bet it has a nice tart & sweet taste ! Must try ! Looks lovely, healthy & delicious 🙂 Yummm ! There’s so much in here I relate to…certain foods taking up too much real estate in the frig, I am intrigued by syrupy raisin sauce, taking a more timid approach so as to make the leftovers more versatile, and Cuban sandwiches? Oh yes. Great #SundaySupper choice! I know, there were so many people and I was so exhausted that I didn’t get to chat with a lot of people that I was hoping to connect with. I think we met at Mixed this past December though too, right? Great looking recipe! Love the idea of apricot dijon glaze. Thanks for sharing! I love ham! I love the idea of this glaze–can’t wait to try it next time I make a ham! This looks awesome, and have relied on Honeybaked Hams in the past. Might give this a try, as I love leftovers too… and cubans? YUM!!! I’ve got to send this recipe to my mom! She’s the one who always makes ham and I think she would love this apricot and mustard version, sounds great! We are ham fan’s and this looks fantastic! Not a ham fan either, but agree a good glaze can change my opinion. Looks good for a sprint or summer brunch recipe. Isn’t that the perfect spring #SundaySupper!! We don’t eat pork but remembering from my pork-eating days these flavors sound wonderful together. I recently made some chicken tenders with dijon mustard and apricot preserves and loved that flavor mix. Yum! I like mustard glazes with ham. Apricots are a nice change from pineapple or raisins! I love ham! I could eat it any day. I’ve always made mine with honey and I’m so ready to try something different. Apricot and mustard sound lovely. I agree with making the Cuban sandwiches too. Oh heavens yes!! I want the glaze all by itself! YUM! I absolutely love apricot paired with ham. I have been wanting to play around with English mustard so I might give this recipe a try with it. I love baked ham, and I love the next day sandwiches much more! This is a great and so easy recipe! I’m with you on not loving ham, but I think with the right glaze (this one would totally do) I’m all over it! You had me at apricot mustard. This looks delicious!